The Red Shadows- BLOOD FOR THE BARON!!! 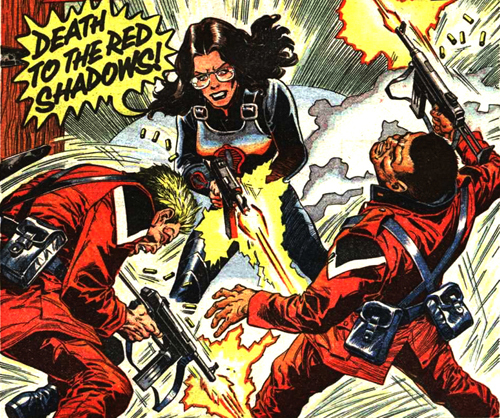 The Red Shadows were an army of fanatical brainwashed terrorists. Led by the maniacal Baron Ironblood, they battled the forces of Z Force, Q Force, Space Force and the SAS, collectively known as Action Force. There were two waves of Action Force and Red Shadow toys by Palitoy. 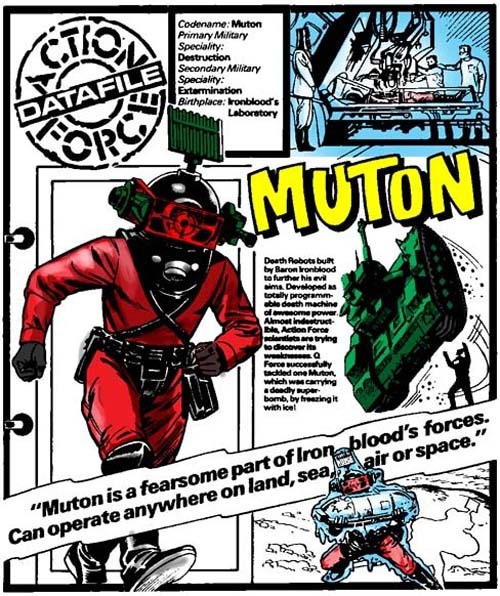 Action Force guested for four weeks in July 1983 in the pages of Battle, the UK's long-running War comic and sister publication to 2000AD. The strip proved to be so popular that a further five promotional mini-comics were given away freely with every IPC publication in the weeks to follow. On the 8th of October 1983 Action Force joined the pages of Battle full time and the title was relaunched as Battle Action Force. 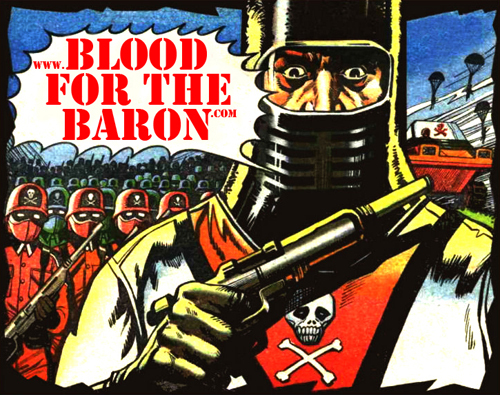 Every single Action Force strip has been lovingly scanned by Jim Marshall and hosted at http://www.bloodforthebaron.com. All of the stories are available as online galleries. 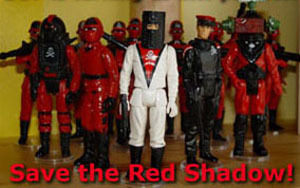 In January 1985 Palitoy dropped the Red Shadow toyline in favour of the traditional GI Joe moulds. They were repackaged as Action Force. IPC countered this with a superb piece of retconning in the strip World Enemy No. 1. 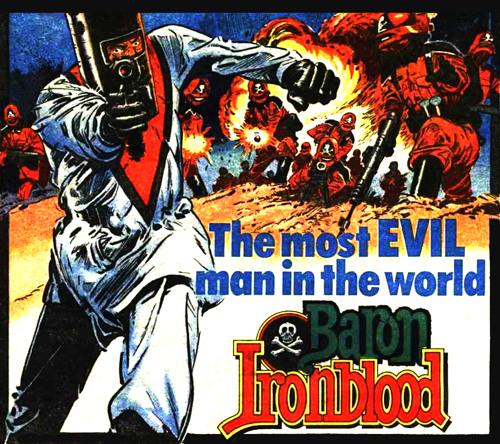 In this story, Baron Ironblood ruthlessly betrays his followers to Action Force and goes to ground. Only his lieutenant Red Jackal escapes the onslaught and vows revenge. He then cuts a bloody trail from one side of the world to the other in his hunt for Baron Ironblood. 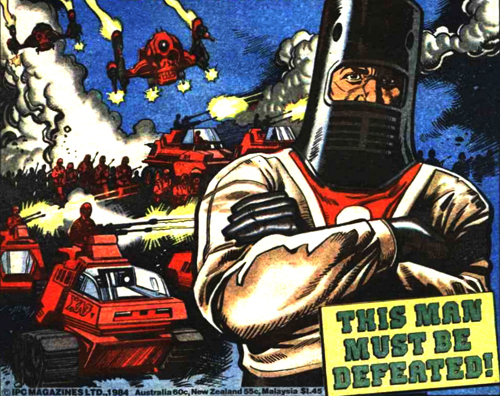 The Baron, meanwhile, sheds both his identity and appearance and remodels himself as Cobra Commander. Red Jackal finds Cobra Commander and attempts to murder him. He fails and is subdued. Upon waking he discovers that he too has been surgically altered, and has mockingly been renamed Destro after his failed assassination attempt (the Red Jackal figure was a UK repaint of Destro). The Cobra movement is born. However, the Red Shadows simply refused to die for Palitoy. The Baron's 2nd in command, The Black Major, resurfaced after months of being MIA and reunited the tattered Red Shadow army. 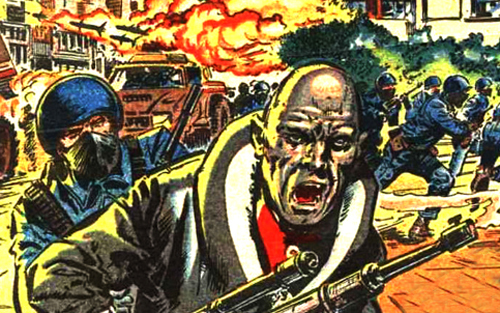 Time and again both they and members of the SAS and Z Force resurfaced in the pages of the new-look Action Force. A full article and speculations can be found here. In the light of the Devil's Due revamp of the Red Shadows, BFTB has been working tirelessly to bring back the Red Shadows. Enlisting the aid of colourists from all around the world, the BFTB Colouring Project has been a massive undertaking. Primarily focusing on the later Red Shadow reappearance stories, the Project aims to bring these strips back to life in full colour. If you would like to contribute please register at the BFTB forum. While there has been huge popular support for the new DDP Red Shadows, which in itself has spawned a new generation of fans, there are still members of the old school fandom who would dearly love to see the characters return in their original form. There is an online petition here. Please sign it!